Most people who built their wealth, did not do so by chance. Successful investing is the result of dedication, planning, and incredible paradigm shifts. If your mission is to build wealth via passive income, it would be smart to identify those habits, and then replicate them! Luckily, we’ve put together a list to help you with the identification part. 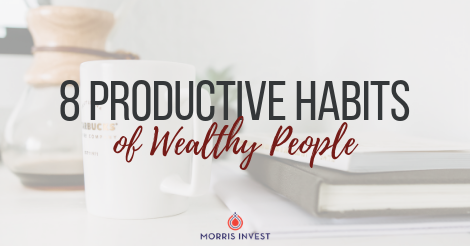 After reading through this list, we hope you will put these habits into practice, and begin the mindset shift that is necessary to build wealth! Focus on the big picture. Building wealth and a large portfolio of rental properties can be a long process. If you get caught in the weeds when little things go wrong, chances are you’ll end up giving up. I like to ask new investors if they would be hung up on small inconveniences if they had 50 rental properties. Likely not! Things like evictions and extra expenses are just part of being in business! See the big picture, and focus on the end goal of building net worth. Build a goal journal. If you listen to our podcast, you probably already know the importance of writing down your goals. Planning out your goals in writing is extremely powerful. It doesn’t matter if you use an actual journal or an app on your phone, but it is important that you write down your goals in one place. Successful entrepreneurs know what their goals are, and are constantly moving toward those goals. Stay true to your why. Why do you want to become an investor? Do you want to spend more time with your family, give back to your community, or take care of a loved one? Once you identify the motives behind your wealth building, how to do it becomes very clear. Find your why, write it down, and stay true to it. Ask for help. Having the humility to ask for help is incredibly powerful. Successful entrepreneurs ask questions, not because they’re ignorant, but because they have a sense of curiosity! Don’t be afraid to ask questions about things that you don’t yet understand, and learn from people who have knowledge in different areas than you. Admit that you don’t have all the answers, and ask people who do! Build strong relationships. You cannot become successful on your own. In fact, I think the term “self-made millionaire” is a gross misnomer. No one has all the skills and knowledge necessary to become successful, so surround yourself with those who have different expertise. From your tax team to your property management company, building strong relationships in business is what will help you become successful. Constantly be in the pursuit of knowledge. Cultivate a reading habit, listen to audiobooks, or watch YouTube videos. Learn everything you can about self-improvement, business, investing, and more! Pay attention to the trends. Get an online news subscription, and pay attention to what’s going on in the news. Stay up to date with the economy, and how it can affect you as an investor. Take action! Successful investors do not sit around and overanalyze everything. Instead, they dive in. Because what’s the worst that could happen? Everything is a learning experience, and like I mentioned before, successful people look at the big picture.